Thursday, the 10th of November, 1653. MR. Warner reports from the Committee for Trade, A Bill, intituled, An Act for regulating the Making of Stuffs in Norfolke and Norwich: Which was this Day read the First time; and ordered to be read the Second time on Saturday Morning next. The House, according to former Order, took into Consideration Persons to be Sheriffs of the several Counties. Resolved, upon the Question, by the Parliament, That Henry Piggott Esquire be, and is nominated and approved of to be, Sheriff of the County of Bedford: And that the Lords Commissioners for the Great Seal of England do issue a Commission to him to be Sheriff of the said County, accordingly. Resolved, upon the Question, by the Parliament, That Douse Fuller Esquire be, and is nominated and approved of to be, Sheriff of the County of Berks: And that the Lords Commissioners for the Great Seal of England do issue a Commission to him to be Sheriff of the said County, accordingly. Resolved, upon the Question, by the Parliament, That Thomas Hampson of Taplo Esquire be, and is nominated and appointed to be, Sheriff of the County of Bucks: And that the Lords Commissioners for the Great Seal of England do issue a Commission to him to be Sheriff of the said County, accordingly. The like Order for Sir Wm. Sidney Baronet, to be Sheriff of the Counties of Cambridg and Hunt'. The like Order for George Warburton Esquire, to be Sheriff of the County of Chester. The like Order for John Eliot Esquire, to be Sheriff of the County of Cornwall. The like Order for Sir Wilfrid Lawson Knight, to be Sheriff of the County of Cumberland. The like Order for Wm. Leech Esquire, to be Sheriff of the County of Derby. The like Order for Peter Bevis Esquire, to be Sheriff of the County of Devon. The like Order for Arthur Radford Esquire, to be Sheriff of the County of Dorset. The like Order for Rowland Place Esquire, to be Sheriff of the County of Duresme. The like Order for Sir Wm. Constable Baronet, to be Sheriff of the County of York. The like Order for Sir Wm. Marten Knight, to be Sheriff of Essex. The like Order for Richard Talbois Esquire, to be Sheriff of Gloucester. The like Order for Wm. Bridges of Tyberton Esquire, to be Sheriff of the County of Hereford. The like Order for Humfrey Shatcrosse of Hatfield Esquire, to be Sheriff of the County of Hertford. The like Order for John Earl of Thanett, to be Sheriff of the County of Kent. The like Order for Peter Bold Esquire, to be Sheriff of the County of Lancaster. The like Order for John Prettyman of Harmingold Esquire, to be Sheriff of the County of Leicester. The like Order for Robert Christofer Esquire, to be Sheriff of the County of Lincoln. The like Order for Edward Keymys of Bartholey Esquire, to be Sheriff of the County of Monmouth. 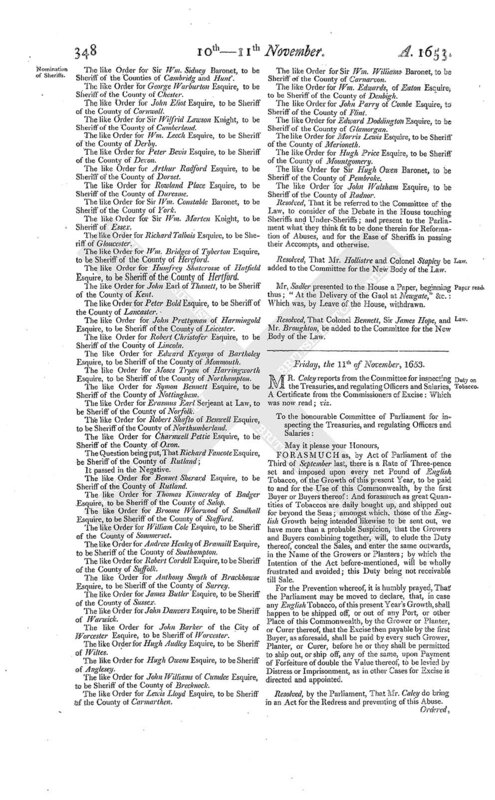 The like Order for Moses Tryan of Harringworth Esquire, to be Sheriff of the County of Northampton. The like Order for Symon Bennett Esquire, to be Sheriff of the County of Nottingham. The like Order for Erasmus Earl Serjeant at Law, to be Sheriff of the County of Norfolk. The like Order for Robert Shafto of Benwell Esquire, to be Sheriff of the County of Northumberland. The like Order for Charnwell Pettie Esquire, to be Sheriff of the County of Oxon. The like Order for Bennet Sherard Esquire, to be Sheriff of the County of Rutland. The like Order for Thomas Kinnersley of Badger Esquire, to be Sheriff of the County of Salop. The like Order for Broome Whorwood of Sandhall Esquire, to be Sheriff of the County of Stafford. The like Order for William Cole Esquire, to be Sheriff of the County of Sommerset. The like Order for Andrew Henley of Bramsill Esquire, to be Sheriff of the County of Southampton. The like Order for Robert Cordell Esquire, to be Sheriff of the County of Suffolk. The like Order for Anthony Smyth of Brackhowse Esquire, to be Sheriff of the County of Surrey. The like Order for James Butler Esquire, to be Sheriff of the County of Sussex. The like Order for John Danvers Esquire, to be Sheriff of Warwick. The like Order for John Barker of the City of Worcester Esquire, to be Sheriff of Worcester. The like Order for Hugh Audley Esquire, to be Sheriff of Wiltes. The like Order for Hugh Owens Esquire, to be Sheriff of Anglesey. The like Order for John Williams of Cumdee Esquire, to be Sheriff of the County of Brecknock. The like Order for Lewis Lloyd Esquire, to be Sheriff of the County of Carmarthen. The like Order for Sir Wm. Williams Baronet, to be Sheriff of the County of Carnarvon. The like Order for Wm. Edwards, of Eaton Esquire, to be Sheriff of the County of Denbigh. 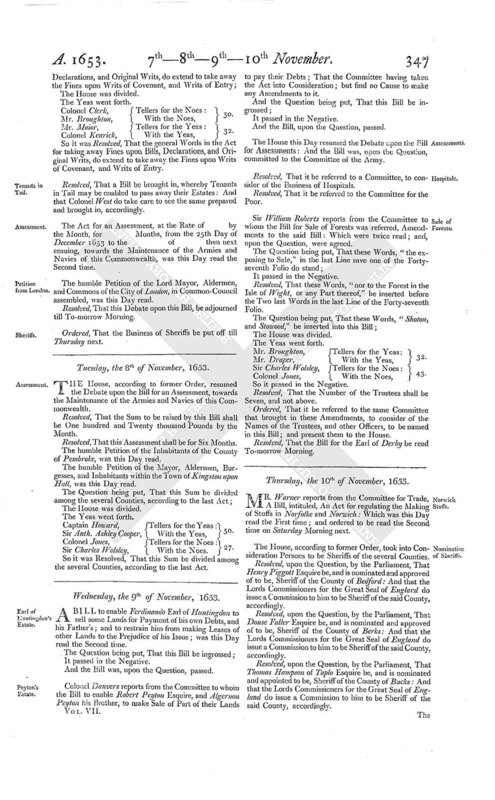 The like Order for John Parry of Combe Esquire, to Sheriff of the County of Flint. The like Order for Edward Doddington Esquire, to be Sheriff of the County of Glamorgan. The like Order for Morris Lewis Esquire, to be Sheriff of the County of Merioneth. The like Order for Hugh Price Esquire, to be Sheriff of the County of Mountgomery. The like Order for Sir Hugh Owen Baronet, to be Sheriff of the County of Pembroke. The like Order for John Walsham Esquire, to be Sheriff of the County of Radnor. Resolved, That it be referred to the Committee of the Law, to consider of the Debate in the House touching Sheriffs and Under-Sheriffs; and present to the Parliament what they think fit to be done therein for Reformation of Abuses, and for the Ease of Sheriffs in passing their Accompts, and otherwise. Resolved, That Mr. Hollistre and Colonel Stapley be added to the Committee for the New Body of the Law. Mr. Sadler presented to the House a Paper, beginning thus; "At the Delivery of the Gaol at Newgate," &c.: Which was, by Leave of the House, withdrawn. Resolved, That Colonel Bennett, Sir James Hope, and Mr. Broughton, be added to the Committee for the New Body of the Law.